A new genetic study in 2003 thought it was dealing a blow to claims that humans had reached America at least 30,000 years ago - around the same time that modern humans were first colonising Europe. The subject of when humans first arrived in America has been hotly contested by academics. On one side of the argument are researchers who claim America was first populated around 13,000 years ago, toward the end of the last ice age. On the other are those who propose a much earlier date for colonisation of the continent - possibly around 30,000-40,000 years ago. The authors of this particular study rejected the latter theory, proposing that humans entered America no earlier than 18,000 years ago. Later evidence would prove them wrong, but this what how they reached their conclusions. They looked at mutations on the form of the human Y chromosome known as haplotype 10. 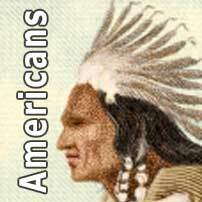 This is one of only two haplotypes carried by native American men and is thought to have reached the continent first. Haplotype 10 is also found in Asia, confirming that the earliest Americans came from there. The scientists knew that determining when mutations occurred on haplotype 10 might reveal a date for the first entry of people into America. Native Americans carry a mutation called M3 on haplotype 10 which is not found in Asia. This suggests that it appeared after people settled in America, making it useless for assigning a date to the first migrations. But a mutation known as M242 looked more promising. M242 is found both in Asia and America, suggesting that it appeared before the first Americans split from their Asian kin. Already knowing the rate at which DNA on the Y chromosome mutates - errors occur - and the time taken for a single male generation, the scientists were able to calculate when M242 originated. They arrived at a maximum date of 18,000 years ago for its appearance. This means that the ancestors of modern native Americans were still living in Asia when M242 appeared and could only have begun their migration eastwards after this date. Dr Spencer Wells, a geneticist and author who contributed to the study, was of the opinion that they entered the Americas within the last 15,000 years. In opposition to this, in 1997, a US-Chilean team uncovered apparent evidence of human occupation in 33,000-year-old sediment layers at Monte Verde in Chile. They claimed that burned wood found at the site came from fires at hunting camps and that fractured pebbles found there were used by humans to butcher meat. But the interpretation of these remains was questioned by several experts who opposed the 'early arrivals' theory. The debate over the biological origins of the first Americans has wide-ranging political and racial implications. In the US, the 'Native American Graves Protection and Repatriation Act' (Nagpra) has resulted in the handover of many scientific collections to claimants. 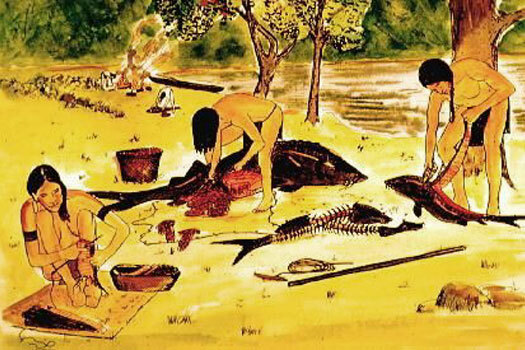 Some archaeologists have argued that the remains of early Americans are sufficiently different from their descendents to be exempt from Nagpra. For example, a 9,300 year-old skull from Washington State which is known as Kennewick Man has been interpreted as having a European appearance due to its long, narrow (dolichocephalic) skull shape. 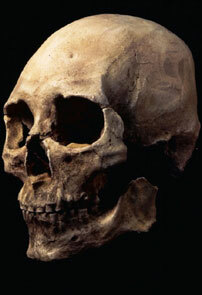 More recent American populations tend to have short, broad skulls. A detailed set of features & king lists focussing on these complex peoples. 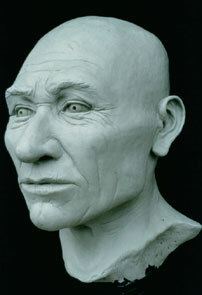 Dr Wells suggested out that individuals such as Kennewick Man looked this way because Europeans and early Americans had a common origin around 35,000-40,000 years ago in south-central Asia. If this is where the first Europeans and Asians/Americans divided then it's something that is still open to discussion. An alternative is that Kennewick Man may have been part of a stray eastern early European group which joined migrating early Asians (see sidebar link to the Mal'ta-Buret' culture for more recent evidence to support a European/Siberian connection). Dr Wells suggested that later migration into America from east Asia between 6,000-10,000 years ago which was associated with the spread of Y chromosome haplotype 5 could have been responsible for the Asiatic appearance of many present-day native Americans. He acknowledged the possibility that even more ancient American populations carrying unidentified Y chromosome haplotypes could have been swamped by later migrations, resulting in their genetic legacy being erased. So there may well have been earlier populations after all.